Welcome to another weekly round-up, where we share (what we see as) the most interesting and important articles from the previous seven days. We’d love to hear your thoughts on any of the issues covered in our chosen links, which include everything from pink sweets to Donald Trump. The image is used under a creative commons license with thanks to New Women New Yorkers on Flickr. 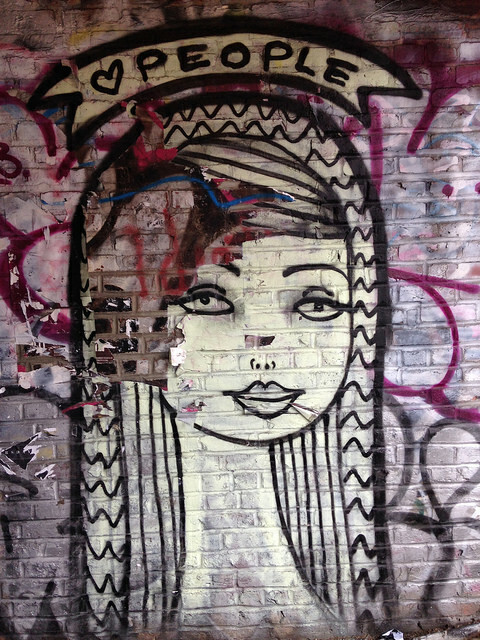 It shows some street art; an image of a person wearing a veil which covers their hair. Their expression is a bit wistful, but a slight smile plays across their lips. Above them it reads ‘Love People’ (with a heart used in place of the word ‘love’).